Aron has spent the last ten years of his life dodging greyskins, traps by creepers and the other innumerable dangers that Pokemon can pose to a single human. An excellent shot with a bow and better at not being seen, Aron is a ghost in the wilderness simply trying to survive. It began in France, strangely enough. December 12th, 2012, only a week and a bit before the so-called Mayan Apocalypse. A great golden box, elaborately decorated with alien symbols, had appeared at the base of the Eiffel Tower. The media instantly jumped upon the strange tale and conspiracy theories abounded. Aliens, the military, god and, of course, the end of the world. For ten days it sat dormant, doing nothing. Any attempt to breach the object failed, and the world's technology proved insufficient to see within the box. Even the material of the object eluded scientists. It was, in short, completely unknown. Upon December 23rd, 2012, the box finally made a move, the top flying off and a liquid pouring out and up into the sky, twisting and writhing to form a grand staircase. It took twelve hours for the liquid to stop falling up into the sky. As soon as the box had began to move the military had moved in, securing the area with tanks and guns. When the staircase finally reached completion a brilliant golden radiance appeared, shining down from the heavens. One of every four men touched by this light fell, screaming in pain. When they arose, they were men no longer. Huge, grey creatures with skin that appeared as stone. These beasts, these 'greyskins,' stood staring at their former comrades for a few short seconds. And then they charged. Bullets ricocheted violently off the skin of the greyskins as they tore into the military, crushing tanks with bare hands. The golden light continued to spread causing trees to move, stones to rise and trash to strangle men in the streets. As it spread across the globe similar effects took place, with more and more of mankind falling to the Light and the creatures created by it. Against the greyskins alone perhaps mankind could have prevailed. The Light had changed though, and far more creatures arose with each passing day. Even worse, powerful creatures had climbed down the staircase, each capable of destroying a city on their own. Mankind didn't stand a chance. By 2014, nearly the entire world had fallen. The Light began to fade but the beasts remained. Only small pockets of survivors remained, trying to make their place in the world. The day The Light arrived began like any other for Aron. At the tender age of five, the boy was playing catch with his father while their new puppy watched as his mother cooked breakfast. It was raining outside, although that wasn't exactly an uncommon occurrence in the Pacific Northwest. When The Light washed over his home, Aron had the good fortune of neither of his parents turning into the grey-skinned beasts. The dog, on the other hand, wasn't so lucky. Bones erupted through the creature's skin even as its hide turned pitch black. As flames and toxic gas spewed forth from the previously cute puppy Aron's' father tackled the dog to the ground even as Aron sprinted away, turning back only once to see his home wreathed in flames. And the boy ran, and ran, and ran. Somehow, some small act of fortune allowed the young boy to meet up with another band of fleeing survivors, some of them with the good fortune to bring guns. And so, the first of Aron's many bands was created. For three months the group manages to avoid any major contact with the wilds, until an unfortunate encounter with giant wolves cut their group nearly in half. And that was how the next seven years of Aron's life went. He would jump between groups, one after the other, as more and more of the survivors were claimed by the beasts the Light had brought forth. Early on Aron escaped due to luck but, as time went on, the escapes became more and more due to his skill, and the groups he traveled with lived longer and longer. The dangers of the Pacific Northwest, while never quite mundane, became something Aron could handle. 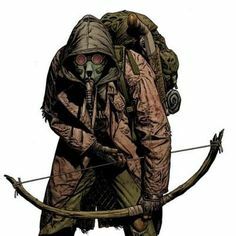 A crudely fashioned bow provided him a way to deter all but the largest predators, and a gas mask provided protection against the creepers. Of course, to stay alive with the beasts, Aron became more and more like them. By the time he was seventeen speaking was a strange occurrence, and Aron found himself spending less and less effort searching for groups. From a distance he hardly looked human anymore, between his thick clothing and large mask. And yet, he survived where many did not. Aron is now twenty and, by his best estimate, it's been over six months since the last time he made contact with a human. There's a group not too far from where he's had his base camp for the past few weeks, but Aron hasn't done anything to reach out to them. That isn't to say that he's ignored them, however; more than one of the residents of the small group of survivors has awakened to berries at the front of their tent, and the direwolves in the area seem to give the camp a wide berth for some reason. Aron isn't a bad person, despite the old saying about fighting monsters. He's just spent too much time alone in the wilderness dodging threats to really know anything else. Growing up from the age of five never knowing if a new group of people was going to help you or steal your supplies will do that to a person. He's slow to speak and slower still to trust, preferring to simply observe until he has no better options. That isn't to say that he isn't interested in people; he watches the group of survivors near him like a hawk, doing everything he can to help them survive and, yet, none of them even known he exists. He simply has seen too many people die and knows all too well that nothing lasts forever to make any more permanent bond with people after being hurt in the past. This has created a sort of cold calculating behavior in the boy; he's capable of calculating the risks and benefits of any action and has left more than one person behind when it was better for the survival of the group. Of course, while Aron is at least somewhat humane to other humans, even those that would try to kill him, he is an absolute brute when it comes to the beasts that plague the world. They've killed his family, innumerable friends and robbed him of any hope of a halfway normal life. He's done anything and everything to survive, whether that be covering himself with creepers he's killed to sneak through a nest, or putting the decapitated heads of direwolves outside his temporary camp. Even the Greyskins, humanoid as they are, are simply a target in Aron's eyes. His hatred of these beasts is only matched by his desire to survive. We shouldn't be here, Aron thinks to himself, slowly pulling his bow over his shoulder, eyes momentarily flitting towards Sam, one of the few girls in the group. Apparently she'd found survival books or something at the library and the bow currently in Aron's hands was proof of that. After a skitterer had broken his last one, the boy had been feeling surprisingly naked. Today Aron and his crew were raiding one of the old hunting shops from the pre-Light times, this one named Cabellla's. Most had been picked dry early, but this one had a small difference: it had a Greyskin tribe living perhaps a half mile away. Aron had been forced into a few scouting trips and, as far as he could tell, the place had more than a few supplies left, crossbows and guns among them. If they could sneak in they'd be able to restock and retreat to safer territory with vastly superior firepower to what they had now. Still, if any of Aron's groups were going to pull this off, this would be the one. There were only six of them, not counting Aron. There was Sam who, while hardly a combatant, was more or less the brains of the group. There were Greg and Flynn, two brothers that were both a few years older than Aron. When they'd joined the group they'd had a dog but, well, things happened. Eric had been traveling with Greg and Flynn before they met up with Aron and, while Aron didn't particularly like him, he was the only one in the group with a gun, making him both the de facto leader and a rather potent weapon. Finally, there was Amanda and her eleven year old son. Normally Aron would have been annoyed with the liability they presented, but Amanda had been able to hack two M.E.T.A.N.G service drones, giving the group a little extra firepower. Overall, Aron would have said it was his third best equipped group. Of course, numbers one and two were long dead, so what did that mean for them? Aron had spent the last two weeks scouting out the best route to and from the building and, fortunately, it seemed like so far his route was safe. They'd made it all the way to one of the emergency exits of the store. The boy lifted a hand to the rest of his group, signaling them to stay back, as he slowly pushed open the door. Fortunately, the alarms were nonfunctional; no power tended to do that to a building. The archer slunk into the building, followed behind by Greg and Flynn as they make their way into the building, the three quickly scanning for threats as they beckon the others in. "Bows and clothing second floor, guns on first," Aron reminds the others, waving Sam, Amanda and her son towards him as Greg, Flynn and Eric made their way towards the guns. The looting was actually going rather well; Aron had gotten a real hunting bow, slinging Sam's across his back for the moment, and a good selection of waterproof camo clothing that would come in handy. Even Amanda was toting a crossbow as they picked what was left of the store clean. That is, of course, until Aron heard a roar that made his blood go cold. A growl he hadn't heard since the first day The Light had hit. A second later, Aron heard gunshots and he knew they were done. In one smooth motion Aron yanked off his gasmask, throwing it to Amanda's son. "Put it on and follow me," Aron shouts, dashing down the stairs, drawing an arrow as he does so. He sees the skeletal dogs assaulting Greg, Flynn and Eric and promptly runs the other way, holding his breath as he dashes through a gas cloud left by the beasts. The chances of him saving those three were too slim to be worth putting the other's survival at risk and, besides. His arrows wouldn't help horribly against a pack of the demons. It wasn't right, but it was the only option. Just as Aron starts to think they're home free, a massive Greyskin slams through the wall, blocking the path to the emergency exit. Without even thinking Aron loosed an arrow, watching in dismay as it barely managed to penetrate the beast's thick skin. The boy had already drawn another, just in time to hear Amanda cry out. R2 and D2! Take it down! the older woman cries, the two small robots slamming into the hulking monstrosity and staggering it just long enough for Aron and the others to put on a burst of speed, dashing out of the store and towards the forest. Behind, Aron heard the occasional gunshot, punctuated by great jets of flame and the war cries of the Greyskins. Soon, the gunshots slowed before finally stopping, just as flames began to climb the outside of the building. Aron forced himself to look away, continuing the sprint into the woods. Soon enough, as Amanda and Sam began wheezing, Aron called for a stop, resting his hands on his knees as he does so. No guns, three of their best fighters dead, and for what? A better bow, a few crossbows and some clothes? That was hardly a fair trade. Aron's thought process is derailed as he sees a lone yellow, bell-shaped flower. "CREE-" Aron manages to cry out before a vine as thick as him arm catches him in the chest, sending him flying into a tree. Dazed and confused, Aron scrambles to grab his bow as he watches the roots in the forest erupt from the ground, vines lashing out at his friends. Amanda was the first to go, neck snapped by a stray flailing vine. Her son fared somewhat better, nearly making it to the edges of the clearing before a vine erupted from his chest, dragging him backwards. And Sam… Sam was entangled, not yet dead, completely snared by the creatures. For somebody less well versed in how the creepers functioned, that might have been hope. But Aron? Aron knew better. She was bait, a trap, meant only to get him back into the clearing at best, and a live meal at worst. As his head clears, Aron grabs his bow, knocking an arrow. "Aron! Aron, help!" his friend cried as Aron took a deep breath, staring down the arrow as he took aim. "Please! Don't let them get me!" the girl cried, almost sobbing, even as the memories come flooding in. Trying to teach Amanda's son to shoot, playing card games with Greg and Flynn, every time Amanda had patched him up and, of course, the long nights he'd spent awake with Sam, just talking. Good memories with good friends, just like every group he'd been with. And yet, they always ended the same. "I'm sorry." Aron whispers as he lets the arrow go, turning away before it finds its target. Sam abruptly stopped crying. Aron walked away, making his way back to base camp even as it began to rain. Even though nobody was around, Aron was thankful for falling water masking his tears. Created when some people were hit by the Light, Greyskins were by far the most common results. Standing at nearly seven feet tall with leathery skin and truly terrifying strength, Greyskins are among the most dangerous beasts for one simple reason: they're intelligent. Where the other creatures use basic pack tactics at best, Greyskins are capable of creating tools, laying traps and plotting ambushes. The only reason that it's possible to avoid them is that, while they're powerful and have intelligence, they're rather brutish, rarely sneaking or making use of their full cunning in favor of more straightforward tactics. Still, if your party goes into a fair fight with a Greyskin tribe, it's over. One of the most dangerous creatures in the Pacific Northwest, creepers are vine-like carnivorous plants that can blanket the floors of a forest without anybody ever seeing them. The instant you step on one you're nearly instantly bound, and your body rapidly drained of blood. The only identifying mark on the creature is a small, yellow bell-shaped flower, although even Aron has trouble spotting them from time to time. Fortunately, creepers are rather stationary, rarely moving the location of their massive traps. Created from both the coyotes and household pets of the former residents of the Pacific Northwest, direwolves are exactly what they sound like; massive, four-foot tall creatures with black fur and a penchant for hunting anything in their territory. They fear fire, which is a small blessing, but were it not for an extensive knowledge of where the creeper nests lied Aron would have fallen victim to these vicious predators long ago. It's always rained in Washington, but for some reason The Light saw fit to make that rain sentient, allowing it to create even worse storms and send forth great gouts of water. If a rainstorm ever seems particularly bad, a cloudburst is usually present. Fortunately, the storm systems are fairly easy to avoid and, despite their destructive nature, more cloudbursts tend to not try particularly hard to assault humans unfortunate enough to enter their domain. An advanced combat unit developed by the United States military before the end of civilization as we know it, a handful of M.E.T.A.N.G remain active, most nearly Seattle and other larger population centers. Programed to defend mankind and assault beasts, M.E.T.A.N.G are the greatest ally Aron can hope for, and has spent more than a few weeks in the vicinity of one of these machines. He spent nearly a year with one he nicknamed "Sparky" before its inevitable demise. The terrifying thing about trolls isn't their abilities in battle. Truth be told, they're nothing too terrifying. Average strength, average speed and so on and so forth. No, it's the fact that they're nearly impossible to kill. With every strike they heal themselves, and the rain causes them to regenerate at an alarming rate. If one of these Pokemon finds you, you're in trouble and likely are counting your time left alive in minutes, not days. Big, nasty spiders, they also seem to have some kind of psionic power. While they're easy to avoid due to the telltale webbing signs in their territory, stumbling into their territory is going to get you killed very, very quickly.